The glycemic index can be a useful tool for diabetics and dieters to want to keep their blood sugar stable or low. In an effort to lose weight, many low-carbohydrate dieters cut their intake of carbohydrates to avoid elevating their blood sugar. Kidney beans are a good source of protein, complex carbohydrates and fiber. They also rank among low glycemic foods, with a glycemic index of 29. If you have never seen a glycemic index chart, you may initially find it complex and extensive. The principles behind the glycemic index are actually fairly basic and easy to understand. In the simplest terms, the glycemic index, or "GI," is a scale ranking foods and beverages on how much they are likely to raise your blood sugar levels. Foods that rank 70 and above will quickly and significantly raise your blood sugar. Foods that rank 55 and under are not rapidly absorbed and have a less significant effect on your blood sugar. Foods between 56 and 69 are somewhere in the middle -- they'll have a noticeable effect on your blood sugar, but won't cause a dramatic blood sugar spike. Harvard Medical School reports that a 150-gram serving of kidney beans -- approximately 5 ounces or roughly one cup -- has a glycemic index ranking of 29, plus or minus 4. At 29, kidney beans are among the low glycemic foods that will not raise your blood sugar to any significant degree. One of the factors that influences a food glycemic index ranking is how long it is cooked or how it is prepared. Boiled kidney beans also have a glycemic index ranking of 29. It is notable that these indices are for kidney beans that do not have added sugars. Some commercial canned kidney beans have added syrups and sweeteners to enhance the taste. The added sugar can dramatically change the glycemic index ranking. 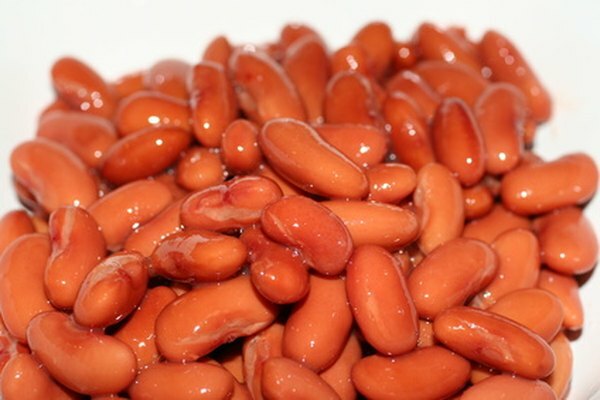 Dr. Jonny Bowden, a clinical nutrition specialist, in his book "The 150 Healthiest Foods on Earth" lists kidney beans among the most healthful foods that you can eat. Beans are a good source of protein, healthful carbohydrates and fiber. Red beans such as kidney beans carry the most health benefits, vitamins and antioxidants. Kidney beans have folic acid, which helps protect your heart. Dr. Bowden also regards beans as "the ultimate blood sugar regulator," because beans have more dietary fiber than nearly any other food. The soluble fiber in beans decreases the rate at which your body absorbs glucose. Not only are kidney beans a low glycemic food, but they also offer "glycemic control," significantly regulating your blood sugar and insulin levels. Kidneys beans are a healthful food that will not significantly raise your blood sugar. While the glycemic index is a good reference, you will also have to consider a food's caloric content if you want to lose weight. Regardless of the glycemic index rankings of the foods that you consume, in order to lose weight you will still have to consume fewer calories than you burn. A good approach is to first remove any high-calorie foods that are high in saturated fat and high in refined sugar. Replacing these foods with low-calorie, lean sources of protein and complex carbohydrates that are high in fiber will be a good first step to lower your overall caloric intake.